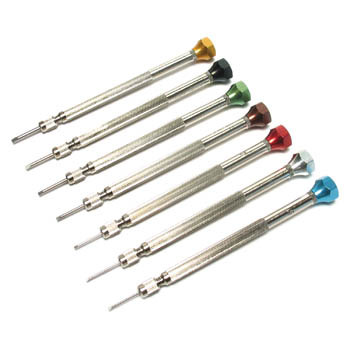 Precision micro screwdrivers for watchmakers and jewelers. 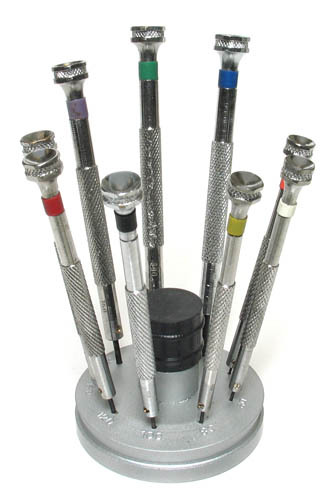 Professional jewelers and watchmakers only use the proper tools for quality work, and Cas-Ker has them all! 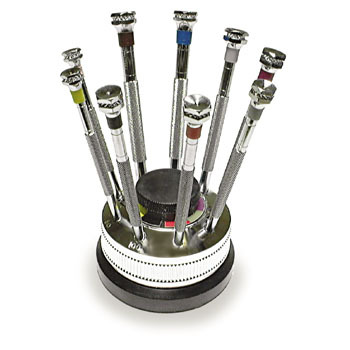 Count on Cas-Ker for professional quality screwdrivers for watch repair and more, from trusted brands like Horotec, Bergeon, VOH, and Grobet. Economy screwdrivers too! 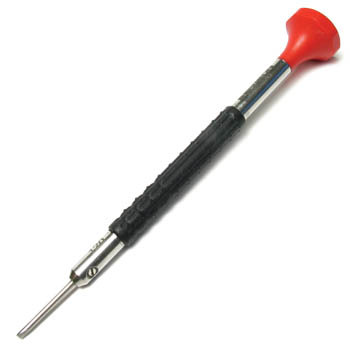 Cas-Ker is your source for watchmakers screwdrivers and so much more! Every specialty tool you need for watch building and watch repair is here. 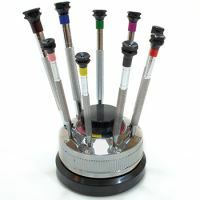 We have thousands of jewelers and watchmakers tools in stock and ready to deliver to you. 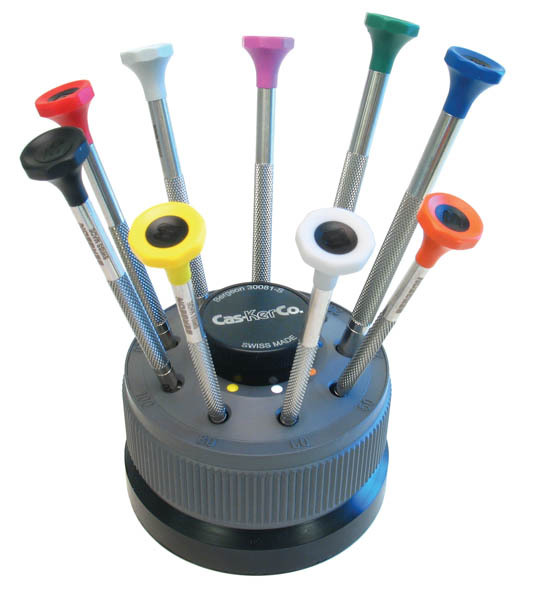 Cas-Ker is an American distributor of watchmakers screwdrivers from Bergeon, Horotec, VOH, and other high quality Swiss manufacturers. 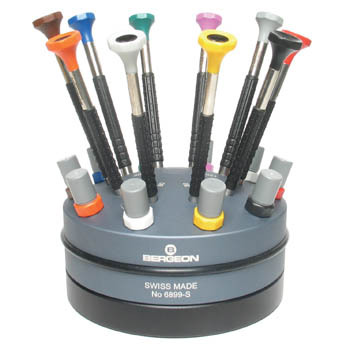 You'll find watchmakers screwdrivers sold in color coded sets based upon size, as well as replacement blades for screwdriver sets. 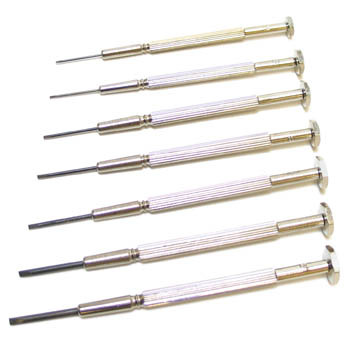 Watchmakers screwdrivers are precision tools, made from high quality stainless steel, and expected to be a long lasting addition to your bench set-up. For those looking for economy screwdriver sets, our Indian and French made watchmakers screwdriver sets offer a balance between price and performance. 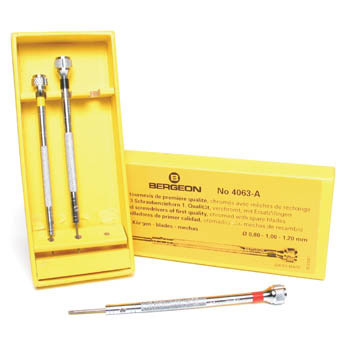 These watchmakers screwdriver sets will allow those who don't need high-end ergonomic screwdriver sets an option if you find yourself not regularly using screwdrivers in your work. 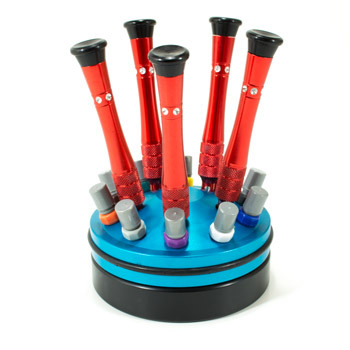 Watchmakers screwdriver sets on a rotating stand are a great way to clean up your work area and ensure your tools are ready to be used at a moment's notice. Here at Cas-Ker we recommend using screwdriver sets with replaceable blades, as this is the most economical option if you find yourself regularly using screwdrivers in your work.